FreshMatic Ultra Spray Refill, Fresh Waters, 6.17oz Aerosol , selling for $8.14 brand new. Manufactured by Reg. There are 2 units left brand new. 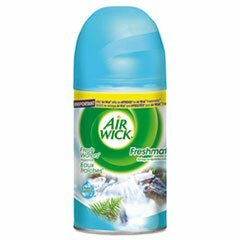 Lasts up to 60 days for a continuous fresh smell. Use in hotels/motels, health care facilities, nursing homes, office buildings, industrial facilities and restrooms. Scent: Fresh Waters; Physical Form: Liquid; Application: Automatic Odor Control; Capacity (Volume): 6.17 oz.